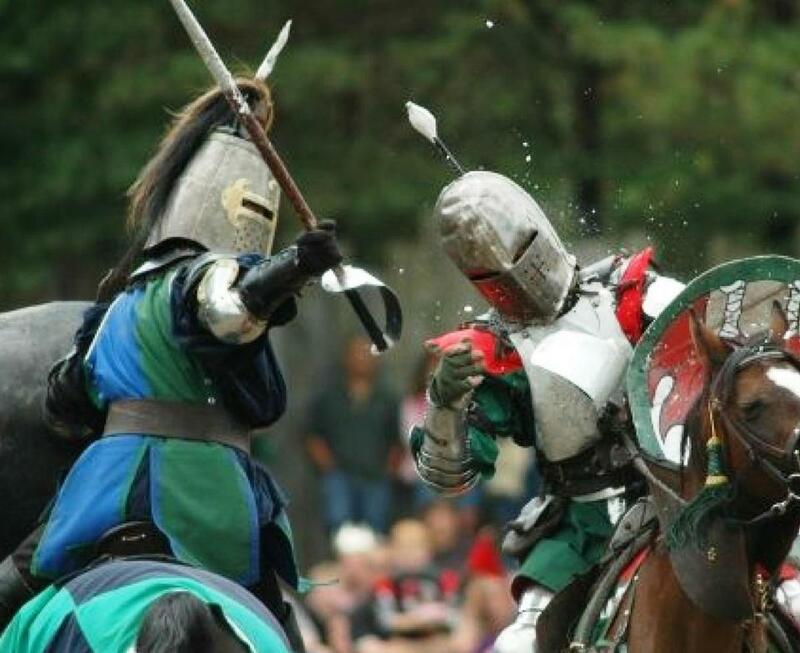 Knights will joust at the King Richard’s Faire in Carver. MAYNARD 6 Bridges Gallery presents “Ascent: Cyanotypes, Paper and Wire Sculptures,” an exhibit by Gail Erwin that contemplates stairs and ladders both literal and figurative, on view now through Sept. 29. A reception will be held on Saturday, Sept. 8, from 7 to 9 p.m. The gallery is located at 77 Main St.. Call 978-897-3825 or visit www.6bridgesgallery.com. WESTON An exhibit by artist Gordon D. Chase titled “Insanity of Violence” opens at the Regis College Fine Arts Center on Tuesday, Sept. 4, and remains on view through Oct. 12. The exhibit comprises large charcoal drawings and sculptural installations that address the psychology of violence in metaphorical terms. The gallery is located on the Regis campus at 235 Wellesley St. Call 781-768-7070 or visit regiscollege.edu/about/fine-arts-center.cfm. WATERTOWN New Repertory Theatre presents “Straight White Men,” a satirical comedy about identity and privilege, by Korean-American playwright Young Jean Lee, who with the show became the first Asian-American female playwright to premiere on Broadway. Performances are September 7-30 at the Mosesian Center for the Arts, 321 Arsenal St. Tickets are $25 to $67. Call 617-923-8487 or visit newrep.org. FRANKLIN Chris Smither, a performer known for playing folk and blues with fingerpicked acoustic guitar for more than 40 years, opens the 29th season of the Circle of Friends Coffeehouse on Saturday, Sept. 8, at 8 p.m. at the First Universalist Society Meetinghouse, 262 Chestnut St. Doors open at 7:30 p.m. Admission is $35. Call 508-528-2541 or visit www.circlefolk.org . 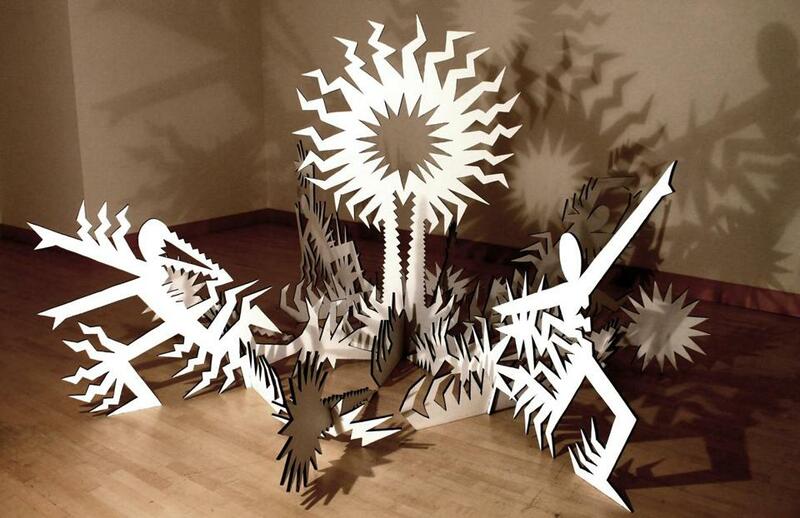 Work by artist Gordon Chase will be on display at the Regis College Fine Arts Center. HAVERHILL Become immersed in Native American culture through food, music, dance, crafts, storytelling, guided canoe rides, and other activities at the annual intertribal pow-wow next weekend. Celebrating its 30th anniversary at the Plug Pond Recreation Area on Sanders Road, the family-friendly event takes place from 11 a.m. to 6 p.m. on Saturday, Sept. 8, and Sunday, Sept. 9. The suggested donations are $5 for adults, $4 for seniors, $3 for ages 4 to 12, and free for ages 3 and under. Parking is free, and a lawn chair or blanket for seating is recommended. Visit mcnaa.org. NEWBURYPORT In observance of September as National Ovarian Cancer Awareness Month, the Newburyport Lantern Festival takes place Sunday, Sept. 2, from 6 to 8 p.m., at the Bartlet Mall Frog Pond. The rain date is Monday, Sept. 3. The event is free with a suggested $10 donation per lantern, which are available at the event, and all are welcome at dusk to decorate them. Attendees are encouraged to bring chairs, blankets, picnics, and flashlights. Visit ocawareness.org/lantern-festival. SOMERVILLE Embracing the poor quality lenses, light leaks, and limited controls of their plastic equipment, American and international photographers will display their creative and quirky work at the sixth annual Somerville Toy Camera Festival held at multiple galleries from Thursday, Sept. 6, through Oct. 13. Programming will include artist talks and panel discussions, workshops, social events, and a darkroom day. Visit somervilletoycamera.org. LAWRENCE The 34th annual Bread & Roses Heritage Festival takes place on Sept. 3 from 11:30 a.m. to 6 p.m., on Campagnone Common, 200 Common St. The fair commemorates the 1912 Bread & Roses strike by Lawrence textile workers. The free event includes a myriad of performances, a celebration of dreamers and doers for social justice, community forums, walking and trolley tours, and children’s activities. Visit breadandrosesheritage.org. 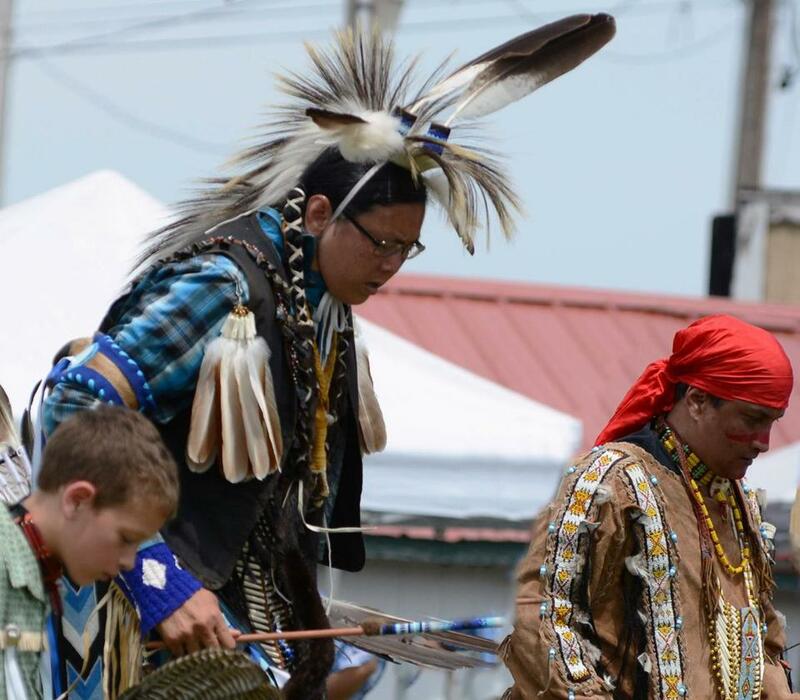 Kainoa Blackeagle and Eugene Waite will dance at the 30th annual Intertribal Pow-wow in Haverhill. CARVER A festive community of actors, tiger wranglers, fire eaters, musicians, singers, aerialists, puppeteers, and old-school vaudeville performers gather for imaginative play and interactive entertainment called “King Richard’s Faire.” Renaissance period entertainments include stage hijinks, a mud show, tournament jousts, and skillful (if sometimes bawdy) turns by musicians, actors and acrobats. The fair takes place at 235 Main St., off Route 58. On Sunday, Sept. 2, the fair offers free admission to active military personnel and veterans with ID. King Richard’s Faire is also open on Labor Day, Sept. 3, and on Saturdays and Sundays through Oct. 21, 10:30 a.m. to 6 p.m. Cost is $32 adults, $16 children. For tickets, visit www.kingrichardsfaire.net/purchase-tickets-in-advance. HANOVER The North and South Rivers Watershed Association will lead boaters on a “Wild Rice Paddle” along the slower portions of the North and Herring Brook rivers, where the wild rice known as “Indian Rice” grows and provides a favorite food for wild fowl. The expedition pushes off from the Hanover Canoe Launch off Indian Head Drive on Saturday, Sept. 8, at 2 p.m. Boaters provide their own kayak or canoe and safety gear, and must show canoe insurance, pay a $5 waiver fee, and register at www.nsrwa.org/nsrwa-events/wild-rice-paddle. The association also is hosting pontoon boat tours down the North River on Monday, Sept. 3, and again on Sept. 29 and 30. Visit www.nsrwa.org/nsrwa-events/nature-pontoon-tour-to-the-spit-sunset. 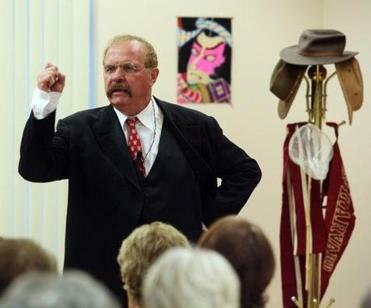 Ted Zalewski portrays Teddy Roosevelt in a one-actor show in Walpole. WALPOLE Actor and educator Ted Zalewski performs his one-actor show, “Teddy Roosevelt: Mind, Body, and Spirit,” exploring the principles the first President Roosevelt embodied as an adventurer, naturalist, historian, father, soldier, statesman, and Nobel Peace Prize winner. A Republican leader for the Progressive movement in the first years of the 20th century, his administration curbed monopolies and child labor. The Friends of the Walpole Public Library bring Zalewski’s free enactment to 143 School St. on Wednesday, Sept. 5, at 7 p.m.
PLYMOUTH Singer and songwriter Dana Fuchs performs a mix of Southern rock, soul, roots, and blues influenced by R&B divas Esther Phillips and Etta James. With a raspy voice that reminds listeners of Janis Joplin, she played the part of the singer in the Off-Broadway musical “Love, Janis.” Fuchs performs at the Spire Center, 25½ Court St., on Friday, Sept. 7, at 8 p.m. Tickets are $28, available at spirecenter.org. The Spire Center also hosts popular Boston comedian Vinnie Favorito the following evening, Saturday, Sept. 8, at 8 p.m. Tickets are $15. Send items at least two weeks in advance to reporters indicated by region.